I said BRRR it’s cold in here! You know the rest of the chant right? Bring it On circa 2000? That’s right, it seems like a cold front has moved in on most of the country- and although we aren’t here to talk about the weather, it certainly it fitting for getting me in the holiday spirit. I always feel a little silly turning on the heat in my car when it’s 45 degrees out, but hey, I like to be warm and toasty so crack that dial up. I love wearing chunky sweaters and beanies everyday, it helps hid my Thanksgiving belly and make me feel less guilty for eating cookies. Lots and Lots of cookies- and bars! 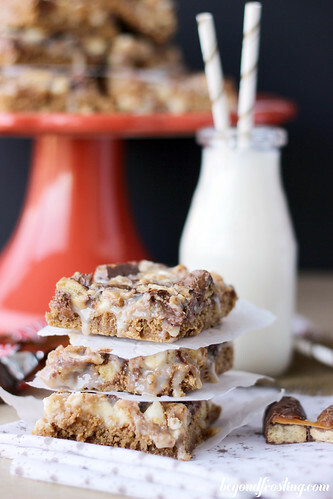 I sure could use another batch of these Gooey Gingerbread Twix bars. The base of the bars is actually made with a box of Spice cake mix, some butter, Biscoff spread and an egg. It creates a dense cake like base and it’s topped with all sort of goodness like- white chocolate chips, toffee bits and Gingerbread Twix. Have you seen those in the stores yet? As soon as they came out I saw them all over Instagram and so I had to see what they were all about. They still have the gooey caramel that I love from a Twix bar with a hint of gingerbread flavor. 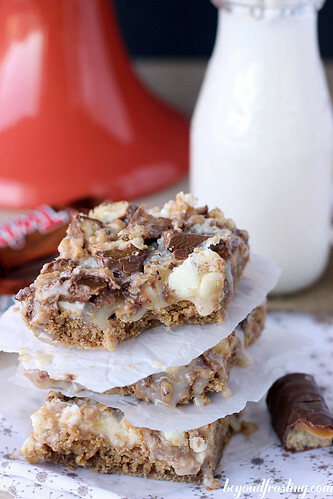 They happen to make the perfect topping for these bars. To finish it off, you got the creamy sweetened condensed milk that I just love! These bars are pretty easy to whip together and honestly, I love the dense cake layer at the bottom. It a nice change from a graham cracker based bar. You can mix it up with your other favorite holiday candy too like Gingerbread MnMs to add a little more color. The idea for the “gooey bar” I saw from Dorothy at Crazy for Crust. She inspired me to make a Peanut Butter Cake bar over the summer. 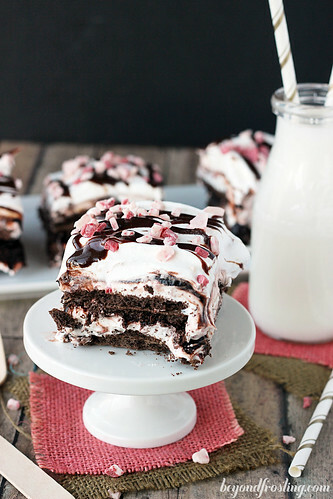 Dorothy makes these amazing Peppermint Gooey Bars and Pumpkin Toffee Gooey Bars. 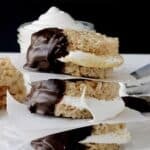 You have to check out the rest of her gooey bar recipes. 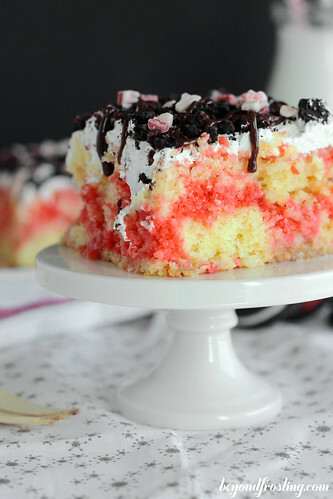 Using the cake mix for the base allows you to come up with all sorts of yummy flavors! Melt butter in the microwave for 20-30 seconds. It just need to be soft but not completely melted. Combine cake mix, cinnamon, nutmeg, Biscoff spread, egg and butter. Mix on medium speed until combine. Mixture will be dough like. Press mixture into the bottom of a 9×13” pan. Cover with white chocolate chips and toffee bits and pour can of sweetened condensed milk over top. 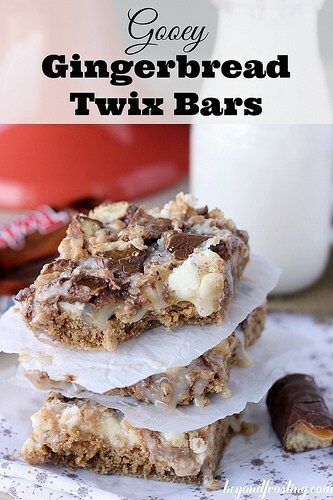 Sprinkle with chopped Gingerbread Twix bars. Bake at 350° F for 22-24 minutes. The edges of the bars will be brown after 20 minutes but it is best to allow to cook for another few minutes to let the milk set. Remove from oven and allow to cool before cutting. Wow, these sound incredible! Gingerbread and peppermint are my favorites during the holiday season. I can imagine how wonderful these taste and the gingerbread twix sounds delicious 🙂 Lovely recipe, thanks for sharing Julianne and hope you have a great weekend! Hi Kelly! Thank you! Hope you have a good weekend as well! Indeed they are! Thanks Jenn! Gingerbread is such a toasty warm flavor, it is perfect for cold winter weather! 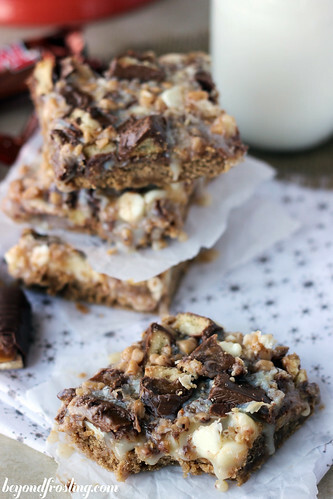 These spicy, gooey bars with a warm mug of cocoa sounds good to me! You are a snowboarder. You must be used to or enjoy the cold. I am a cold weather wimp. Usually, I hibernate until spring. This year I stocked up on cold weather gear (4 layers!) so I can continue to take my hyperactive dog to the dog park!